by Robert W. Firestone, Ph.D. Forward by Jon Carson PsyD, Ed, ABPP. 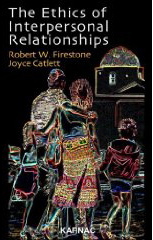 This work is an attempt to explain the source of destructive behavior and how it manifests itself in personal relationships between couples, families and in the social arena. It presents a position that offers a hope of altering the destiny of humankind’s unethical behavior.